This took place over the weekend of, June 4th & 5th planned as an extension of what would have been a Sunday Drive. Steve and I took advantage and headed up to Clare Friday afternoon, for some early tastings. With cold nights expected power to run the fan heater was essential. Our trip notes gave a history of the towns and regions we passed through, and looking for the answers to our quiz questions, made our journey more interesting. 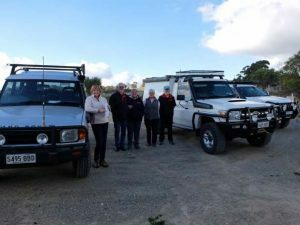 Arriving on the Friday had its advantages, we discovered the information centre which is next to the Clare Caravan Park, have Happy Hour every Friday night, with a different winery hosting each week. Not only wine tasting, but the opportunity to sample local produce as well. We met up with the rest of the group, Saturday morning at the Seven Hills Cellars and Church. Peter and Lynne, Geoff and Sonya. Despite the numbers we knew a good weekend was ahead. The day was cool but, despite drizzle Friday night, was dry. Sometime to explore the Church and crypt searching for quiz answers before we headed back to the caravan park, so the 2 vans could check in. Power for heating all round it seems, and with sites plentiful at that time nearly adjoining. 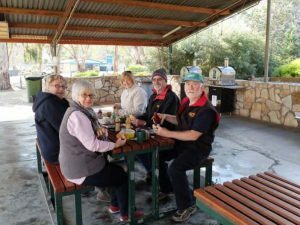 After a sausage sizzle lunch supplied from funds donated by the club, we headed out on the first half of our adventure with trip notes and quiz questions ready. Geoff and Sonya led this leg, and what a good start we missed the first turning, Peter giving subtle hints from the tail. Stopping at various points of interest, where the race was on between Sonya and myself to find the answers for our quiz. Knowing that a grand prize would go to the winner. We made our way to Brooks Lookout to take in the views across Jacob Plains, from the Southern Flinders to the Hummocks, fortunately a clear day. The second leg of our adventure was more interesting. The Clare Historic Walk by vehicle, negotiating narrow streets while taking in the points of interest and looking for quiz answers. Saturday finished with an enjoyable dinner at the Seven Hills Hotel. Sunday was overcast and rain was on the way, so as Steve and I were heading home that day, a quick camper pack up was on the agenda. We had negotiated with the park to leave our camper on site so long as it was packed, and were thankful we closed it just as the rain came. After a relaxed breakfast Steve and I led our second day. 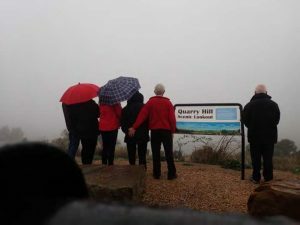 This time we headed south, with our first stop Quarry Hill Lookout.Constant drizzle and fog by this time, so you can imagine our view from the lookout. We continued to make our way to the small settlement of Mintaro, where there are 33 State Heritage listed building. A short trip up to the Slate mine, and then on to find the old Blacksmiths shop. We must have misinterpreted what Peter had said. On arrival at the site of the old Blacksmiths we were searching for quiz answers looking for an old shop. Geoff and Sonya faces were pressed against a glass door, when suddenly it opened and a woman was beckoning us in. Well what a surprise, what was the old Black Smiths Shop, has over the past decade been transformed into a spectacular home, using original wall, beams and fixtures where possible. We felt very privileged as we browsed photographs of its transformation, and were given a guided tour. 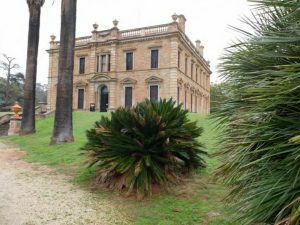 Our last stop was Martindale Hall, which we all decided was worth paying the small entrance fee to explore. Our Cruise finished with lunch back at the Caravan Park finishing off the sausages and chevs. Mid-afternoon we parted ways, Steve & I home, Peter, Lynne, Geoff and Sonya who had decided to stay another night off to chill out in front of the fire of a winery or two and drink away the drizzle. Many thanks to Peter foran excellent and informative trip. I would not hesitate in revisiting this trip again.